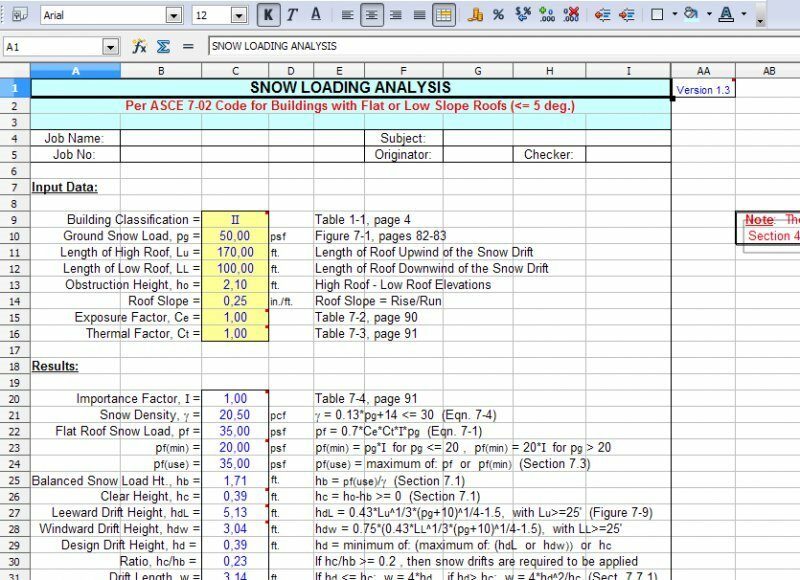 ASCE702S is a spreadsheet program written in MS-Excel for the purpose of flat roof snow loading analysis for buildings and structures per the ASCE 7-02 Code. 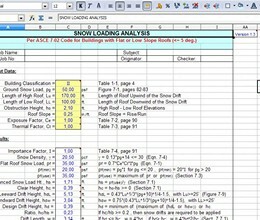 Specifically, coefficients and related and required parameters are selected or calculated in order to compute the net design snow loads, including snow drift due on lower roofs and rain-on-snow surcharge. 1. This program specifically follows Section 7.0, Snow Loads, of the ASCE 7-02 Standard, "Minimum Design Loads for Buildings and Other Structures". 3. This program addresses only balanced snow loading, snow drifts on lower roofs, and rain-on-snow surcharge loading. Unbalanced roof snow loads are not considered. 4. This program assumes the possibility of either leeward or windward snow drifts, and the larger of the two calculated drift heights per the code is used as the design drift height. Leeward drift results from snow blown off a high roof onto a lower roof. Windward drift results from snow blown against a rojection or wall below a high roof. 5. This program determines any rain-on-snow surcharge loading when applicable. Rain-on-snow surcharge loading is not required for ground snow loads, pg > 20 psf, nor for roof slopes >= 0.5:12 (2.38 degrees). This program conservatively combines the rain-on-snow surcharge loading with snow drift loading. However, per Code, rain-on-snow surcharge loading need not be combined (superimposed) with snow drift loading. * ASCE702S download link provides freeware version of the software. ASCE702S has been rated 4.0 out of 5 points. A total of 1 votes cast and 0 users reviewed the software.